Vanilla Ice, seminal nineties white-boy rapper and reality-show-set smasher, is returning on Sunday with season two of his honest-to-God home renovation show The Vanilla Ice Project. A surprise hit for the DIY Network, the series follows Ice (née Rob Van Winkle) and his hands-on team as they transform busted foreclosures into luxury homes, then flip them for profit. The show is the catalyst behind the rapper’s resurgence, and as it turns out, it’s a lot more fun to be Vanilla Ice now than it was in 1991. Last year, for instance, he learned to ice skate for the U.K. reality competition Dancing On Ice, released his sixth studio album (WTF: Wisdom, Tenacity and Focus), and shot a supporting role in the upcoming Adam Sandler film I Hate You, Dad, all while turning his season two house into a decadent, iPad-controlled “smart home.” Vulture spoke to Rob about being a modern-day Bob Vila and got an exclusive scoop on his next reality show. What are we in for this season? The season two house was sitting for three years before I bought it. It’s on three acres. I built a lazy river in the backyard and put this tiki hut in the middle of it like an island. On the inside, I put in a pneumatic elevator; a panoramic, 200-inch 3-D gaming system room with vibrating chairs; and a cinema that looked like an auditorium out of a castle. Flush-mount iPads throughout the entire house in every room, because the house is a smart house, which means that with your smartphone anywhere in the world, not only can you zoom in and see people on the cameras, you can open the gates, unlock the doors, shut all the electronic drapes, you can dim the lights, scroll through 6,000 movies, and say, “I want Forrest Gump at eight for my guests to come over,” or you can turn on your waterfall. It’s amazing what you can do with the technology. That’s insane. There’s some disagreement about how much your season one house flipped for. Zillow says it went for 850. Zillow is about as accurate as Wikipedia. [Laughs.] Yeah, it sold right away. The power of television: People came straight in, they bought it, full asking price, didn’t even haggle with us. You have this “investing super course” that you’re selling from your website. Is it disingenuous to tell people to invest in real estate when real estate values are so low right now? It makes more sense than any other time in the history of the world. You can make more money in real estate today than ever before, but you have to understand that you can’t have the same strategy as you had before. Before, it was so easy that you could basically buy a house, keep it a year, and sell it — change the carpet and put some paint on it and make a profit. Those days are gone. The way to do it now is that you go get these short sales and foreclosures, or tax liens, tax auctions. You have two young daughters. How much of your 1990 album To the Extreme have they heard? They’ve heard all of To the Extreme. Did you have to explain the lyrics to “Stop That Train“? Ummm, not at this point. It’s over their head and we want to keep that innocence. You gotta protect it. I do have music that has explicit lyrics that I will not let them listen to until they’re at least 18. I just tell them, “Listen, some of that music that Dad did is not meant for kids. It’s not Barney the Dinosaur.” To the Extreme, even though there’s no explicit lyrics, there is some content in there that is, heh-heh, a little bit sexual. “Stop That Train” was the reason I wasn’t allowed to have your record when I was 12. That one, and there’s other songs on there, too — “Life Is a Fantasy.” [Raps.] “In my dreams I envision myself at the ocean / Beautiful girls rubbin’ me down with some lotion.” That song is another one. [Laughs.] Did you finally get it or did you sneak it behind your parents’ back? I went to other people’s houses to listen to it! And I remember “Stop That Train,” and I don’t remember anything from the MC Hammer album I was actually allowed to listen to. So you seem to be a lot more laid-back than you used to be. Did you have a particular moment when your perspective changed? How did you end up in the new Adam Sandler movie? Oh, Adam is a great guy! I was in the U.K. doing Dancing on Ice, and I get a call from Adam Sandler. 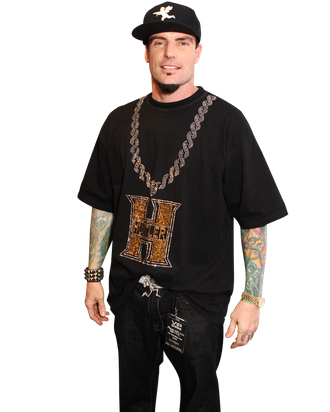 Him and his wife were sitting in bed watching The Vanilla Ice Project, and his wife actually came up with the idea of getting me in the movie, and she looked over at him and she said, “Adam — ” And he said, “Don’t even say it, I already know what you’re going to say: Put Vanilla Ice in the movie.” So I got a call, went down to Happy Madison [Productions], hung out with him, played guitar with him on the set, and we became great friends. I talked to him today, even. He’s a super-good friend now. And the movie is, I swear, and I’m not even exaggerating at all, hands-down, the funniest movie ever made in the history of the world. Do you have any other hobbies that we might be seeing a reality show about? So your career at this point is pretty much doing anything that pops into your head. That’s it. I’m on freestyle.